Sunday, November 6 from 9 a.m. to 2 p.m.
San José, CA – October 19, 2011 --- It has become a tradition on All Saints Day to celebrate our ancestry, our forebearers who have passed on before us. This year to commemorate Dìa de Los Muertos/Day of the Dead the festivities will again be held at Oak Hill Memorial Park with an outdoor mass on Sunday, November 6. Oak Hill Funeral Home and Memorial Park is Celebrating their 165th anniversary as California’s oldest secular cemetery. Oak Hill welcomes friends, family, neighbors and beyond to commemorate their 6th annual Dìa de Los Muertos, also known as All Souls’ Day or Day of the Dead, on Sunday, November 6 from 9 a.m. to 2 p.m. The ceremony is dedicated to honor those friends and relatives that have passed away. An outdoor mass will be held at 10:30 AM. The Mass Service will be held at Our Lady of Guadalupe section of Oak Hill Memorial Park, and will include the traditional sweet bread, coffee, champurrado, live music and ceremonial dances. The custom of All Saints’ Day and Day of the Dead dates back to 600AD and is a custom that is preceded by Halloween or All Hallow’s Eve. It has evolved into a ceremonial commemoration. 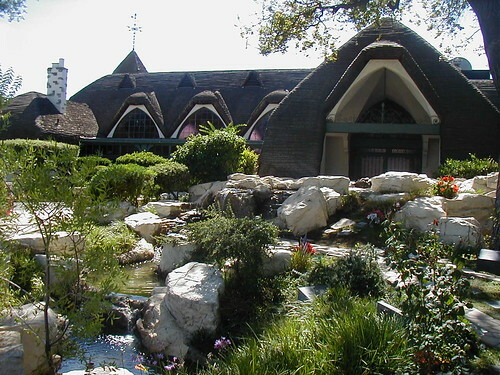 Oak Hill Funeral Home and Memorial Park is located at 300 Curtner Avenue at Monterey Highway in San José. For more information call 408.297. 2447. Here's a great stat to start the weekend off with... the local unemployment rate is dropping. Last year the San Jose metropolitan area had an 11% unemployment around this time, in August 2011 it was 10%, and the latest figures have unemployment pegged at 9.6%. This is compared to a state unemployment rate that currently stands at 11.4%. So in other words, unemployment is dropping in San Jose and our job market is outperforming the California average by almost 2%. For more info, you know the drill. 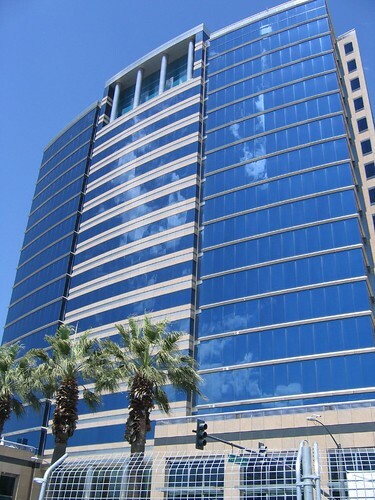 Oracle has decided to partially occupy the the 380,000sqft Sobrato Tower, which they own thanks to their BEA acquisition. They are currently building out 65,000sqft split between the 3rd, 8th, and 9th floors. This will help decrease Downtown's office vacancy rate and put more feet on the ground in front of San Jose businesses and restaurants. As a side note, 488 Cafe is a new restaurant on the ground floor of the Sobrato Tower. For more information on the Oracle move, click here. Easily the most impressive haunted attraction that I have every been to in the Bay Area. It is the only haunt in a location that is creepy in and of itself. Not only does the maze wrap around the world famous Winchester Mystery House, but it incorporates a real pet cemetery as well as various authentic buildings on the property. The props seem like they are straight out of a Hollywood movie and the scares are impressive and unpredictable. The finale in the seance room will blow you away! It may be worth getting the VIP pass because you'll want to do this one more than once. The cost is $20 per person ($30 per person for VIP with multiple entries). A massive haunted maze that is actually 2 haunts back to back. The first one is a little bit tame but has great ambiance. The second seems to go on forever and is downright terrifying. Everything is pitch black in the second maze, which gives the staged scenes a lot of extra pop. The cost is $20 per person for both mazes. The largest Halloween event in Northern California by a mile. 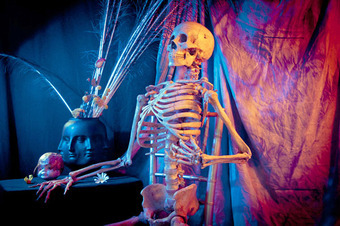 This is the fourth annual Halloween Haunt and maybe the last given the sale of the theme park. There are 6 haunted mazes (only one is new) a single haunted ride, 3 scare zones (one less than last year), and various shows. Most rides worth going on are still open and the roller coasters are being run with all the lights turned off. I hate to say it but this was a huge disappointment this year. Even on opening weekend it was completely packed, they were not spacing out entrances properly so none of the attractions were able to provide good scares, and they really didn't even try to make it bigger or better than last year. The cost is between $25-40 per person. I didn't do this one this year, but I heard it was great. Instead of doing 2 haunts they have one very large maze (seems to be becoming a trend). The haunt should take 15+ min and incorporates part of their cornfield maze. The cost is $25 per person. A high school production may seem out of place on this list, but I assure you that this one is 100% worthwhile. As opposed to your typical maze where you have people randomly popping out at you, each year there is a unique story with hundreds of actors, making you truly feel like you're immersed in a horror movie. You can also forget the saying "don't touch the actors and they won't touch you." Past events have included surprises like receiving fake shots, being completely separated from your party, and even wet hands touching the back of your neck while you are in pitch darkness. Insanely scary and much more interactive than any of the major venues. Plus the money connected is donated to charity. One caveat, due to how awesome this haunt is there may be a 2-3 hour wait. At least you'll have the high school dance team dressed up as zombies entertaining you while you wait (and performing Thriller in its entirety every 15min). The cost is ~$10 per person. Oct 27-29 only, starting at 7pm. 555 Glenwood Dr., Scotts Valley. We're still waiting on a decision from Major League Baseball as to whether the A's can move to San Jose, but that isn't stopping Lew Wolf from acquiring all but 2 parcels required to build the 14 acre stadium. 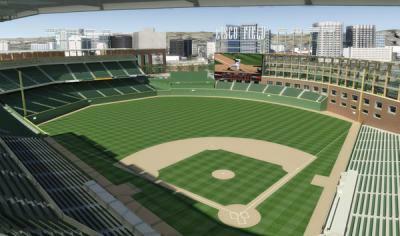 Having ownership of the land will give the commission one less reason to prevent the A's from calling San Jose their home. Google Offers has finally launched in San Jose! Their first deal is $15 for $30 worth of food at Sonoma Chicken. The deal is on for another 12 hours or so. If you're interested, just click here. In Baltimore the first Google Offer is for Blue Hill Tavern -- “one of Baltimore’s most impressive dining spaces” according to Baltimore Magazine. The artfully designed dishes are as eye-catching as they are palate-pleasing. Enjoy delicious comfort foods and views from the rooftop patio with today’s offer: $15 for $30 worth of food and drinks. Visit the acclaimed cultural mecca of the Twin Cities with today’s offer for the Minneapolis Institute of Arts. For $1 you’ll get admission to the MIA’s special exhibition: “Edo Pop: The Graphic Impact of Japanese Prints” (up to $8 value), where you can enjoy the finest of rendered color and texture from the Far East and beyond. 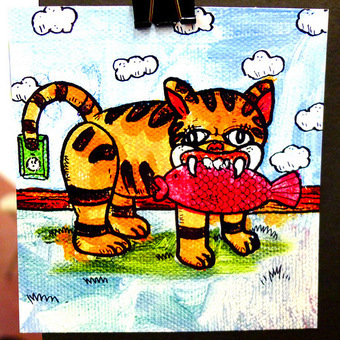 The Edo Pop exhibit runs Oct. 30, 2011- Jan. 8, 2012. Burgers are on the menu in Sunny San Diego. Our day-one offer is for the famous local eatery, Crazee Burger. Choose from more than 25 creative burger types (including wild boar, ostrich, alligator and more! ), fresh salad and savory sweet potato fries. Today’s offer is $10 for $20 toward delicious grub at this favorite local spot. Enjoy the “best of Silicon Valley” at Sonoma Chicken Coop, which serves up an award-winning combo of fresh fare, fast service, and friendly prices to all corners of Silicon Valley. Grab today’s Google Offer for San Jose and get $30 toward food and drinks for just $15 at participating locations. Sweet Tomatoes will be the 5th restaurant to open up at the new @First project bordering 237 and North First Street (Five Guys, Chipotle, Panda Express, and Panera are already open). On November 1st they will have their official grand opening; however, they have a great concept for a "soft opening" this weekend. On Oct 28th, 29th, and 30th they will be charging only $5 for the buffet. The best part is 100% of that money will go to the American Red Cross Silicon Valley Chapter. It's a promotion where everybody wins! Diners get a substantial discount, money goes to a great cause, and new employees get trained before the grand opening. Friday, October 28, from 11:00 a.m. to 2:00 p.m. and 5:00 p.m. to 7:00 p.m.
Saturday, October 29, from 11:00 a.m. to 2:00 p.m. and 5:00 p.m. to 7:00 p.m.
Sunday, October 30 from 11:00 a.m. to 3:00 p.m.
For only $5.00 (five dollars), guests can enjoy Sweet Tomatoes’ 45-foot salad bar full of fresh, seasonal vegetables and tossed salads, made-from-scratch soups and hand-crafted muffins, focaccia, breads and desserts. Sweet Tomatoes will donate 100 percent of the proceeds to the American Red Cross Silicon Valley Chapter, a non-profit, humanitarian organization that depends on the generous contributions of time and money from local Santa Clara County residents and companies to provide services and programs that help our community prevent, prepare for and respond to emergencies. Sweet Tomatoes seeks to be a vital and contributing part of each community in which it operates. To reach this goal, restaurants offer a “Fun-Raiser” program through which charities, churches, schools, athletic teams, scout troops and other non-profit organizations may raise funds by hosting in-store events. The restaurants assist in marketing the non-profit’s event by creating master flyers for distribution and promotion. Sweet Tomatoes, named one of America’s “Best Chain Restaurants” byParents Magazine, offers a rotating menu of more than 100 original, made fresh dailyrecipes featuring signature salads, soups, bakery goods and hot pasta sauces, at an all-you-care-to-eat price. All food is prepared without the use of artificial flavors, colors, additives or artificial trans fats. Sweet Tomatoes in North San Jose will be open daily from 11:00 a.m. – 9:00 p.m. on weekdays, 11:00 a.m.-10:00 p.m. on Friday and Saturday and 9:00 a.m. – 9:00 p.m. on Sundays beginning on November 1. For more information visitwww.sweettomatoes.com or call (408) 526-0200. For more information on American Red Cross visit www.siliconvalley-redcross.org. Sweet Tomatoes was founded in 1978 in San Diego and currently operates 121 salad buffet-style restaurants across the western, southern and eastern portions of the United States. Sweet Tomatoes cares about what comes out of guests’ wallets and into their bodies by creating an exceptional, all-you-care-to-eat dining experience with a daily selection of made-from-scratch soups and salads and hand-crafted muffins, focaccia, breads and tasty desserts. By combining high-quality, farm-fresh and scratch-made foods for a fixed price, the restaurants provide guests with the freedom to create their own wholesome meals. The restaurant concept is built around fresh prepared, great-tasting recipes with a salad bar full of seasonal vegetables and tossed salads prepared exhibition-style every 20 minutes. Sweet Tomatoes restaurants are open daily for lunch and dinner. For more information, visitwww.sweettomatoes.com. Founded in January 2009 with the merger of the Palo Alto Area and Santa Clara Valley chapters, the American Red Cross Silicon Valley Chapter is a non-profit, humanitarian organization that depends on the generous contributions of time and money from local Santa Clara County residents and companies to provide services and programs that help our community prevent, prepare for and respond to emergencies. Led by volunteers and supported by community donations, your American Red Cross Silicon Valley Chapter is part of a nationwide network of approximately 710 locally supported chapters dedicated to saving lives and helping people prevent, prepare for and respond to emergencies. Weekly Sharks Update: Welcome to the New Season! As this is my first post of the San Jose Sharks’ 2011-2012 season, welcome to another exciting season of Sharks hockey! For those of you new to my Sharks posts here on The San Jose Blog, during prior seasons, I routinely posted relevant updates (with much more frequent post-game updates during the playoffs). Starting this season, I plan to post updates once per week to provide my Sharks game analysis and to shine light on notable updates to the team and organization. In the near future, I plan to provide video updates for those of you who wish to watch updates provided in that format. As for my hockey “experience,” besides being a Sharks fan since their inaugural 1991-1992 season, I played in the Magnitogorsk Metallurg hockey development program as a kid (where Evgeni Malkin played), before moving to play D1 hockey in high school, before briefly playing in the WHL (Seattle Thunderbirds). Eventually, I decided to attend Santa Clara University to earn Accounting and English degrees, and am currently limited to playing an “offensive defenseman” role for adult “beer league” play on the weekends. As of today, the Sharks stand at 3 (wins) - 3 (losses) - 0 (OT losses), after winning their last two road games against the New Jersey Devils and Boston Bruins, respectively, to improve their once abysmal 1-3-0 record for the season’s start. During the off-season, the Sharks made a tremendous amount of adjustments, with the purpose of building a team capable of winning the Stanley Cup. Sharks fans are already accustomed to watching a team continually qualifying for the playoffs. While repeated post-season eligibility is good sign, a city with no prior Stanley Cup victories (like San Jose) leaves the fans hungry for more. The fans want to see a winning team. Even though the Sharks have yet to play in a Stanley Cup Final series, appearing there is just going to be another step in the momentum that is bringing the elusive hardware to San Jose for the first time ever. To assist the Sharks with doing this, General Manager Doug Wilson made several notable changes. During the last two seasons, the fans clamored for “more defense,” and while this issue had partially been addressed during last season (with Ian White, who has since been signed to the Detroit Red Wings), drastic line changed were implemented, in addition to the acquisition of veteran Colin White, and the major trade to acquire defenseman Brent Burns from the Minnesota Wild for fan favorite right winger Devin Setoguchi. The trade came as a shock to most fans, as less than a day prior to the trade, Setoguchi agreed to a three year extension with the Sharks. Burns has already proved to be a real asset so far with his fantastic puck handling, strong defense, and putting up good scoring numbers. From Burns’ days in Minnesota, he was highly regarded for his off-ice activity and charitable contributions as well. In another move, the Sharks sent Dany Heatley to the Minnesota Wild for Martin Havlat. Havlat had put up similar numbers to Heatley last season and has historically had stellar playoff production, as opposed to Heatley, who many fans saw as underachieving in the post-season (tallying only five goals in the last three post-seasons combined). In addition, it is noted Heatley would have provided a $2.5 million greater salary cap hit per season. Along with the Burns and Havlat acquisitions, the Sharks acquired Michal Handzus from the Los Angeles Kings, the same player who had been a perennial thorn in the Sharks’ side during the regular season and Western Conference Quarterfinals against the Kings last season. Doug Wilson surely did not forget Handzus from last season. So far this season, the Sharks have made known their ability to control and shoot the puck, evidenced by their “shot on goal” count (especially in comparison to their opponents), and their shot on goal tally can be even higher if the Sharks can keep many of their non-deflected shots from flying high and wide of the net. Although any high level hockey player can express the importance of shooting the puck at the net, the NHL (as expected) requires shots with greater accuracy and velocity. A dominant shot on net tally, however, can prove to show how well the opposing goaltender is playing. Shots need to be put in the back of the net. If we can look at it this way, which shots are more effective? Are they the shots from the point (the area near the blue line, where the defenders stand), or the shots up close? Either way, each shot counts as one shot on net, but it is clear the more devastating shots are the ones that are up close. Shots up close are what made the Anaheim Ducks so deadly when they played the Sharks on Tuesday, the 18th. Veteran forward Teemu Selanne tallied two goals that night (in addition to several shots on net) using the same strategy: by sneaking behind the Sharks’ defense to be in position for his shots. Although getting set up for more lethal scoring opportunities is easier said than done (especially from my “fan’s perspective”), some teams can very effectively clear out the goalie’s crease and slot to keep other players from sneaking in for a point blank shot on net. If the Sharks can effectively deliver more accurate shots and clear the front of their net, they will prove to be a dominant force this season. The Sharks must execute more accurate shots, not counting the extremely common shot deflections that occur and bouncing/rolling pucks (that are unpredictable for every level of hockey player). I understand that, in most cases, players are attempting to pick corners and ovoid other players when blasting the puck at the net, however that means the players must be quicker at releasing the puck from each of their sticks, and handling/shooting a puck not bouncing around must be on the mark. There are no excuses. The Sharks have real potential this season, and as I have mentioned before, a playoff entry is all I care about, as far as the regular season goes (besides the Sharks winning at home when I am in attendance for the excitement factor). As for the post season, our weaknesses must be ironed out. If the last year’s Boston Bruins squad can win the Cup, so can the Sharks. Let us cheer on our team this year – loud and proud! GO SHARKS! Downtown Condo Crawl Open House + Free Drink at SPSM! This Saturday from 12-4pm you can check out all of the high-rise condo buildings in Downtown San Jose with free pedicab transportation between each one! If you have ever wondered what living in a high-rise would be like, this would be a good opportunity to get more information and see all of your San Jose options. As an added bonus, if you visit all 3 towers you will get a drink ticket for use at the San Pedro Square Market (complete digression here, but it's really coming along nicely and well worth a visit). Just a quick post to mention a free program at the Tech to teach children and their families about math and science. Contact Tammy for more details! MathWorks is a free, bilingual Spanish program for children and their families. These math and science activities are designed to teach parents and families how to help reinforce math skills that are being taught in school. These basic skills have been identified as those needed in order to be successful in math and science. Snacks are provided for participants. Each MathWorks session is 6 weeks of Saturday classes. Unfortunately we have run out of the number which has become synonymous with Silicon Valley, 408. Last week regulators approved a new 669 area code for the South Bay to kick in next year. The means that starting October 2012, everyone will have to dial a prefix of 1-408 to call 408 numbers, even if you are dialing from a 408 number. In November 2012, ALL new South Bay numbers will have a 669 area code. So how do you all feel about the change? Fresh & Easy May be Coming Downtown! This could be the news of the month if it comes to fruition. The retail anchor spot formerly occupied by Su Vianda (and Albertsons before that) has been vacant for well over a year. Now Fresh & Easy--a new market to the Bay Area similar to Trader Joe's--may be filling the void. This would be a tremendous resource for San Jose residents and visitors. They also have a large selection of ready-to-eat options, which is not a strong suit for The Market at the moment. As Matt mentions below, another huge added benefit would be if they are able to keep the general area clean. I'm keeping my fingers crossed on this one! Lucky’s / Su Vianda location next door to City Hall. Seven prolific Bay Area artists exhibiting work and wares to peruse and purchase in the spirit of Halloween and Dia de los Muertos. 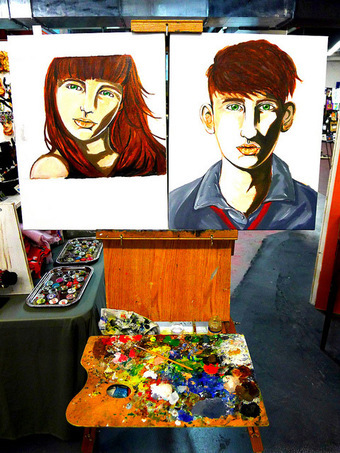 Each artist varies diversely in style and medium. All approach the strange with affinity and find a muse in the macabre; Assemblage, Collage, Dolls, Jewelry, Paintings, Photography, Sculpture and so much more. Libations will be served. Costumes and festive attire welcomed. Yet another company is moving to San Jose! SunWize specializes in solar energy solutions for various applications and fits in nicely with San Jose's long term "green vision." They primarily do residential, commercial, and industrial solar installations. SunWize is moving from Kingston, NY and is a subsidiary of Mitsui. In his famous challenge to John Sculley, Steve Jobs asked if he wanted to spend his life selling sugared water to kids, or did he want to change the world? Jobs was quite a salesman. About a year after that famous quote, I saw much of that legendary asset when I met him to discuss the new Apple headquarters that he wanted to build in the southern reaches of San Jose. He had I.M. Pei to design it, bundles of cash, more cachet, and a plan that was "awesome." And he made me an offer that was tough to refuse: He'd make San Jose a great city. Jobs even talked about living in a loft downtown. Wow. You could really see that glimmer of greatness. But within a year, the man he seduced to lead Apple would send Jobs on his way, and with him went much of the spark that so enlivened that company. Gone but not forgotten. Like many other parents, I made sure a Mac was on my daughters' desks, part of their kit like a pencil. There was a sign in my grammar school library at old St. Joseph's -- now under the Adobe Towers -- that said, "you can travel the world over in your library." Now it was possible in your own room. It was a gift to education and a boon to Luddites like me as well. The word "great" is nowadays used in the most casual way. I prefer it for those who have transcending ideas or real courage. Jobs surely did. Some of the reason for his unique cult status was his straight talk. It was as legendary as his ability to turn the inventions of others into cash. As the "Woz" has noted, "he sells all the stuff I made." In my conversation with Jobs about the "insanely great" headquarters that he would build, he disparaged a prominent Silicon Valley developer and philanthropist as a "sleaze ball" and ranted about how Jacob Rothschild had changed a deal at the last minute to buy a New York apartment. He only savaged the important and dropped only the best names. He was brash and a bit annoying. And remember, he was still in his mid-20s. Others have written how he changed the world, and I will let others more qualified expand on it. Costa Rica to Ireland. Steve Jobs helped us all to dream a little more and to make those dreams easier to see. He may have been the supreme visionary in this special valley. Perhaps most remarkable was that as a young man, he wrote his own epitaph when he said to another: "Do you want to change the world?" Steve Jobs surely did and we are all the better for it. TWO BUCK Tuesday _ Oct. 18th! 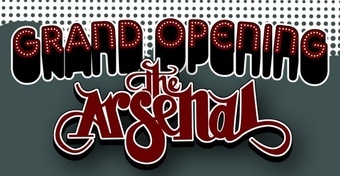 Sean Boyles and Roan Victor will answer questions about San Jose's new artist-run art supply store, The Arsenal. This month at the sketch table, come draw Harold the articulated skeleton who will be posing all night for your drawing pleasure! Bring your own art supplies or use the paper and pencils provided. 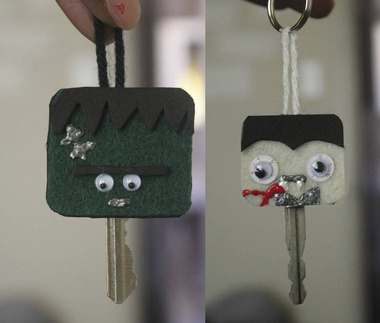 Frankenstien’s monster, The Werewolf and The Mummy, have been haunting generations of Americans, and what better way to pay homage to the classics and the greats during one of the spookiest time of the year, than a with a monster head key cover. Join Leeonnista and for $2 you’ll find Dracula, The Mummy, Frankenstien’s monster, The Bride of Frankenstien, The Werewolf and Jason. Don’t see your favorite ghoul? Feel free to make your own for $3! Need some good fortune, abundance, love, romance or joy in your life?? 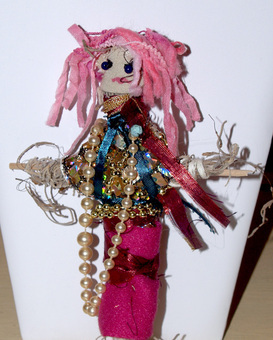 Come and learn how to make your own personal juju doll with Tere Barbella! 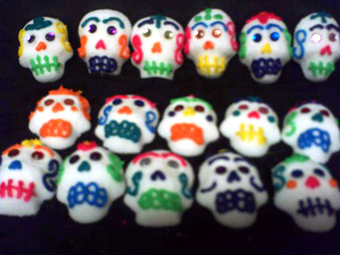 Juju dolls are the talisman for good, white magic. Learn how to make your very own and personalize it to bring forth all the good things in life. $2.00 will cover materials. Feel free to bring personal items like lucky charms, jewelry, beads, to make your doll extra special! 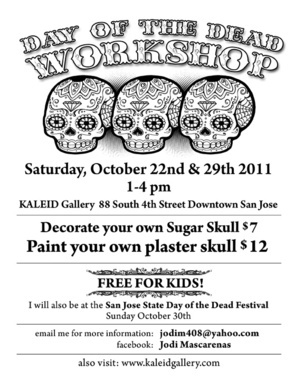 Jodi Mascarenas will give a sugar skull workshop and create hair feathers! San Jose Creatives invites you to stop by their table to learn more about the SJC blog project and even participate in an interview if you want. San Jose Creative’s is a blog that interviews the extremely talented creative community of San Jose. We feature artists, designers, musicians, makers, art supporters and anyone who lives a creative life. We ask everyone the same 13 questions to gain insight into and find out what makes these individuals unique. + match your favorite coloring book characters. Free! Michael Denning will unveil the 2nd Volume of his book series Sacred Geometrix. The first 50 copies are autographed and personally numbered. 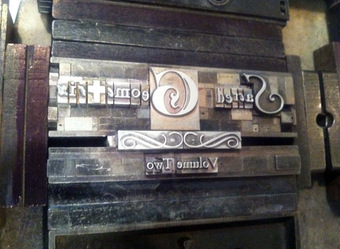 The cover was created on an antique hand-operated tabletop letterpress and all the books are hand stitched. 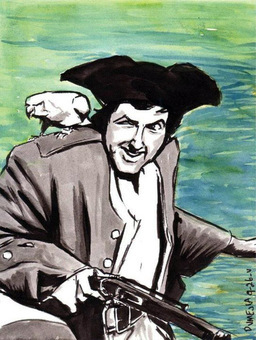 David Mejia our resident portrait artist will draw you while you wait for a small fee! Sugar & Spice Theresa & Amber will delight you with their sweet & savory treats! Jehoiakim Santos will be selling his homemade vegan oatmeal cluster for $2 each! free & all ages welcome! Ubiquiti is a San Jose based company--HQ is on Tasman--that has just completed it's Initial Public Offering (IPO) on Friday. It will be traded on the NASDAQ with the ticker UBNT and is the first IPO in 8 weeks for the United States. Ubiquiti raised about $100M dollars, and this also gives company shareholders a chance to cash out and spend some money in San Jose =). For more info on the IPO click here. Not related to Ubiquiti, I'm planning to put together a list of consumer-oriented San Jose companies for those of us that want to support local companies as much as possible. Examples are Netgear for consumer networking products, Switch lighting (about to release LED light bulbs that will change the world), and Super Talent for USB drives. Great new art supply store opening close to The Usuals! And of course Food Trucks! “Las Cadre” Opening Reception Saturday, October 15. 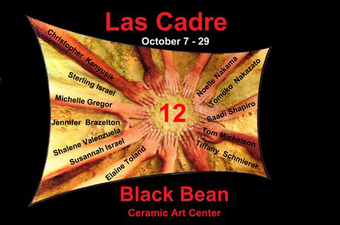 6 p.m. to 9:00 p.m.
Twelve artists of the “Las Cadre” critique group celebrate their first five years with a show at Black Bean Ceramic Art Center. Meet the artists, enjoy the art and explore the centers gallery and studio. Participating artists; Noelle Nakama, Tomoko Nakazato, Saadi Shapiro, Tom Michelson, Tiffany Schmierer, Elaine Toland, Susannah Israel, Shalene Valenzuela, Jennifer Brazelton, Michelle Gregor Sterling Israel and Christopher Kanyusik. Art works available for purchase. Wine and refreshments served. Open to the public Monday through Saturday 11:30 a.m. to 5:30 p.m. Here's a nice statistic that was released earlier this year. A company that analyzes happiness across one's career has released the best ten cities for men that want to balance work and family. At the top of the list... San Jose! Fore more info click here. When I think of theater in Downtown San Jose usually The San Jose Center for the Performing Arts, The Rep or the Montgomery Theater are the first places that pop in my mind. The fact is that there are also several smaller, more intimate venues that are featuring quality programming spread across Downtown. Right in the middle of SoFA, you have a 200 seat theater called The Stage which has won many awards for their off-Broadway performances. They have just extended the run for their latest production: Cabaret, which you can read all about below. I'm definitely planning to check out this theater soon (as well as City Lights and the Theatre on San Pedro Square). There are more live performance venues Downtown than many people realize, and The Stage is one of those hidden gems. San Jose Stage Company announced that the Tony Award-winning musical Cabaret, the provocative and edgy new production, will be extended two more weeks. The ‘up close and personal’ Stage theatre, set in a cabaret-style atmosphere, has been showing to sold-out crowds. Critics have been raving about The Stage’s season opener, Cabaret. “Audiences are finding the show highly entertaining and extremely relevant to today's world,” added King. The classic Broadway musical, set in the smoky, seedy Kit Kat Klub, reflects the sentiment in pre-World War II, 1929 Berlin. Based on the book “The Berlin Stories” of 1945 by Christopher Isherwood, who set the foundation for the subsequent renditions, from “I am a Camera” to the 1972 movie Cabaret to the Roundabout version at Studio 54. Carmichael ‘CJ’ Blankenship* brings a new edge and sexual energy to his choreographer debut, while also playing the role of Victor. Most recently from the sold-out eight-week run of Avenue Q, and previously at The Stage in Reasons to be Pretty, Company Associate Artist Halsey Varady* plays Sally Bowles, the English cabaret performer. A special appearance by Jef Valentine breaks new ground with The Stage Company as the Emcee of the Kit Kat Klub. Judith Miller, known to audiences for her iconic roles as Patsy Cline and Mae West, portrays Fraulein Schneider. Also features Company Associate Artist and Musical Director Martin Rojas Dietrich*, Lydia Lyons*, Will Springhorn Jr.*, Matt Bariletti, Christine Capsuto, Clarissa Chun, Chellana Dinsmore, Brandon Mears, and Allison F. Rich. Book by Joe Masteroff, Lyrics by Fred Ebb, Music by John Kander, Based on the Play by John Van Druten, Stories by Christopher Isherwood, Musical Director is Martin Rojas Dietrich, Choreography by Carmichael ‘CJ’ Blankenship and the Director is Rick Singleton. Tickets are $33 - $45 and are available at thestage.org or by calling the Box Office. Premium Cabaret seating is available for the front row of the theatre. Please call the box office at 408.283.7142 to purchase these seats. San Jose Stage Company is funded, in part, by a Cultural Affairs grant from the City of San Jose and Arts Council Silicon Valley, in partnership with the County of Santa Clara, the California Arts Council and Applied Materials Excellence in the Arts. San Jose Stage Company gratefully acknowledges support from The Wallace Alexander Gerbode Foundation, The William and Flora Hewlett Foundation, The Smart Family Foundation, Applied Materials Foundation and The Davidson Family Foundation and the many individuals, businesses and corporations whose contributions make great theatre possible. The Stage is located at 490 South First Street at William Avenue in the SoFA area of downtown San Jose.